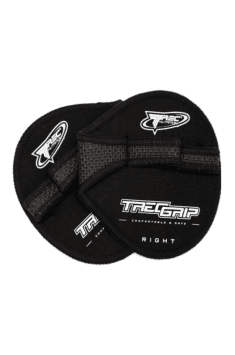 Trec Grip Heavy is a new solution for people who want to train without traditional gym gloves, and yet they want to protect their hands and improve the grip strength. Thanks to innovative solutions, in addition to the above-mentioned advantages, the grips are characterized by much greater lightness and airiness, enabling efficient thermoregulation. The greater the training experience, the greater the load used during training sessions. However, sometimes there is a situation in which the athlete feels that he or she is able to perform the given exercise with a greater load, but they are limited by the inability to keep it in their hands. In such situations, some of the training accessories may turn out to be helpful – gloves, belts, hooks or grips. For those who value universal use, neoprene handles are the most recommended. Thanks to them, the bar will scarcely ever slide out of clenched hands, thus preventing from strength and bodybuilding stagnation. Mechanical injuries of the hands are next to the reduced strength of the wrists, a serious problem in the proper maintenance of the barbell. This feeling is known to both young and advanced adepts of strength sports. Roughly finished bars, on the one hand, are to prevent them from slipping off, on the other hand, they severely strain the local condition of the epidermis, leading to its thinning. This problem can be easily solved by putting on the offered handles. They are made of neoprene – material that not only is resistant to mechanical damage, but it also protects the hands against minor injuries. The adhesive coating additionally protects against possible abrasion of the bar while performing dynamic movements during training. The material itself can be subjected to different temperatures, it is also resistant to all kinds of dirt present in the gym. The grips are suitable for washing in a washing machine, without the fear of damaging them, which in case of regular leather gloves becomes impossible. Heavy workouts are quite a challenge for the whole body, but only these bring the desired results. Literally and figuratively "you have to sweat" to achieve any success. Sweaty hands are often the cause of discomfort, reducing the satisfaction from the exercises performed. Most gloves are equipped with thermoregulation-improving systems, but they will never be as effective as the release of hand from the material. The grips protect only the palmar part, thanks to which a much smaller part is covered with synthetic material. This creates much better conditions for giving up the heat from hands to the environment, preventing excessive sweating. In addition, they do not restrict the wrists, which allows for maintaining the physiological movements of the joints. In conclusion, Trec Grip Heavy is the perfect solution for people who want to increase the strength of their muscles, enhancing hand grip skills. The well-thought-out solutions used, allow to achieve this in three ways – protecting the palm of the hand against abrasions, excessive sweating, and also ensuring good adhesion to the material. This accessory is dedicated to anyone, regardless of training experience.